“I’m a Real Photographer” trumpets the title of this first survey exhibition by Keith Arnatt. Presumably we are meant to see this as a proud assertion of identity by a man who started the ‘60s as a painter and entered the next decade as one of Britain’s best-known Conceptual artists (participating in such shows as “Information” at New York’s Museum of Modern Art in 1970 and “The New Art” at London’s Hayward Gallery in 1972) yet in 1973 decided to his farewell to all that. “Would you help me to become a photographer?” the already forty-three-year-old artist asked David Hurn, then a teaching colleague at Newport College of Art in Wales and now the curator of this exhibition. Arnatt really came into his own, however, when, in 1986, he began using color. The blunt title of the series “Pictures from a Rubbish Tip,” 1988—89, gives no idea of the chromatic radiance and luminous nuance that Arnatt finds in decaying refuse. Suddenly one becomes curious about those forgotten paintings of his. 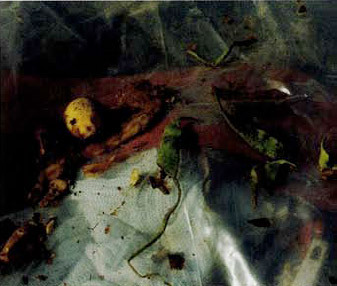 Again, there is a vaguely forensic connotation to the idea of poring over castoff clothes and rotting fruit chat connects to Atget, but the intensity of attraction repulsion embodied in these works seems very much of its time, recalling contemporaneous work by Helen Chadwick (e.g., “Meat Abstracts,” 1989)—though Arnatt’s images are far subtler and more powerful—or Cindy Sherman (compare Untitled #175. 1987). In Notes from Jo,” 1991—94, Arnatt photographed messages left for him, by his wife, thereby chronicling what was apparently not an easy marriage (WHERE ARE MY WELLINGTONS YOU STUPID FART?). While the deadpan presentation of text recalls Arnatt’ s conceptual period, his eye for specifically pictorial effects is razor-sharp: Only in a photograph could the red-marker ink of TURN OFF ONIONS IF BURNING collide so devastatingly with the green lining of the envelope on which the words have been scribbled. Having stopped worrying about being a real artist in favor of worrying about being a real photographer, Arnatt leaves us in no doubt he's still a real artist.